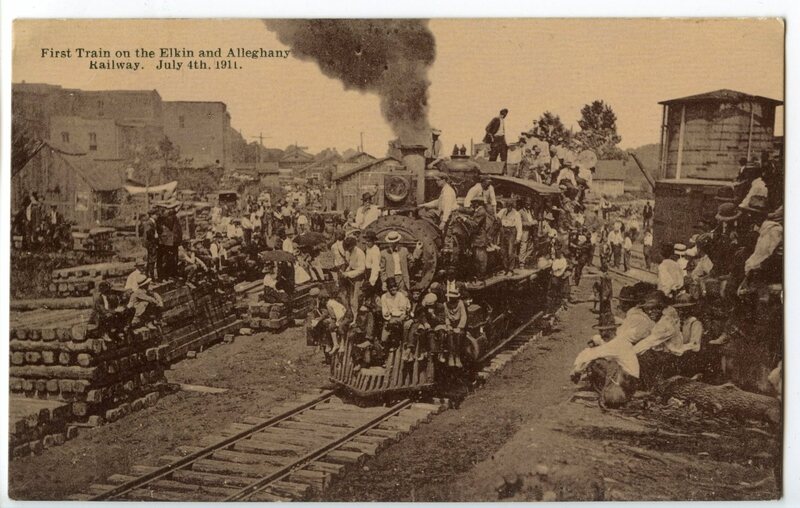 Do you have photos and/or Remembrances of the Elkin & Alleghany Railroad? As many citizens know, the Elkin Valley Trails Association (EVTA) is working to build a trail on part of the decommissioned Elkin & Alleghany Railroad bed that ran from downtown Elkin to the base of Stone Mountain. To help support our efforts we plan to publish and sell (in October 2012) a history book about the Elkin & Alleghany Railroad. Dan Bray of Swan Creek has generously donated to the EVTA all of the original photographs and materials from his seminal study on the E & A Railroad that was published in 1979. We plan to expand on his already splendid work. Our group of writers in the EVTA is searching for additional photos and remembrance. We can digitally scan negative, photos, prints, post cards or other materials to add to the book. The owner keeps the originals and we’ll have a digital copy for posterity. Incidentally, the EVTA has collected and digitalized hundreds of photos of old Elkin and other communities in the Elkin Valley. If you have any old photos you would like digitalized and saved, please share those with us too. We’d like to give a shout out to the Elkin Tourism Development Authority and Nu-Line Printing for their help with copying and mounting these old photos for a permanent exhibit that will be on display next year. Perhaps even more important, the EVTA hopes to include in this book a series of personal remembrances about the E & A Railroad. Do you know any bits of history told to you or from personal experience about the engines, cars, shop, the engineers or firemen, stories about the construction, episodes about the convicts who worked on the construction, shipping and hauling up to Veneer and Devotion, any connection with the Elkin Valley Post Office and Depot, etc.? If so, we’d really like to interview you and, if you are willing, we’d like to add interesting stories to our book. Your input will make the book so much more interesting to readers and significantly to the knowledge of the Elkin Valley and all the communities that the E & A Railroad served. Call Randall Ray at 828-215-9694, or email randallraync@yahoo.com or call me at 835-4630 or email at wjblackley@gmail.com and we can arrange for someone to interview you and to digitally scan materials related to the E & A Railroad that you would share with us. All the work on this book together is being done by EVTA volunteers and all income from sales will go to the EVTA for trails construction and improvement. ← Next Trail Workday: March 10 – Join Us!